A Hellenized Jew, and convert to Christianity. Fluent in five languages, and extensively studied in theology and the classics. Monk in several communities in Egypt, returning to Palestine in 333. Priest. As a young man he founded a monastery at Eleutheropolis (Beth-Saddouk), and lived there as a monk for 30 years, serving as its superior. Bishop of Constantia and Metropolitan of Cyprus in 367 while remaining in his monastery. Fought Origenism and Arianism. Friend of Saint Jerome, but opponent of Saint John Chrystotom whom he found insufficiently orthodox. Brilliant speaker, he sometimes let his ability go to his head, and his confrontational approach got in the way of persuading his opponents. Doctor of the Church. He was an authority on Marian devotions, and his writings include a Bible dictionary, and The Medicine Box, a huge work which cataloged and refuted eighty heresies of his day. Daughter of Count Egano Lambertini of Bologna and Castora Galuzzi. While still a child, she put together a little oratory in her house, and spent much time there in prayer. She felt drawn to religious life, and planned to become a nun. Student at Dominican Convent of Valdi-Pietra in Bologna, Italy, partly in preparation for religious life. Had a great devotion to Saint Agnes of Rome, of whom she may have had visions, to Mary as Queen of Angels, and to the Holy Eucharist. On 12 May 1333 she miraculously received her First Communion, and immediately after died in an ecstasy of love and joy. Fourteen-year-old orphan, brought to Rome by his uncle, Saint Dionysius. Convert to Christianity. Martyred with Saint Nereus, Saint Achilleus, and Saint Domitilla for publicly proclaiming his faith. Pope Saint Vitalian sent his relics from the cemetery of Calepodius in Rome to the British Isles as part of the evangelization of England, so they would have relics of the Church at large, and to install in altars in new churches. 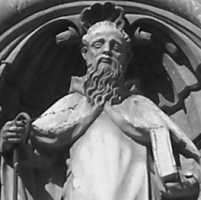 Saint Augustine of Canterbury dedicated the first church in England to Saint Pancras, and subsequent churches throughout England are similarly named for him. Born to the nobility, the daughter of Ernold. Married to the Frankish nobleman Saint Adalbald of Ostrevant. Her family objected to Adalbald's military incursions into their region, and endlessly opposed the marriage. Mother of four - Saint Eusebia of Hamage, Saint Clotsindis of Marchiennes, Saint Adalsindis of Hamay, and Saint Maurontius. The couple dedicated themselves and their fortunes to care for the poor and to religious projects including founding a Benedictine double monastery at Marchiennes, Flanders, Belgium. After Adalbald was murdered, she was pressured by the royal court to remarry. She refused, and with the help of her friend, Saint Amandus, she became a Benedictine nun at the Marchiennes monastery. Abbess there for forty years. Three of her children, Adalsindis, Clotsindis, and Maurontius, lived there in religious life during her time. Oldest of seven children born to Juan Miguel Cipitria and María Jesús Barriola. The family were weavers, and Juana learned the craft as a child. At age 18 she left home to work as a maid to a family in Burgos, Spain. Juana early felt a call to religious life, and on 8 December 1871 she founded the Congregation of the Daughters of Jesus to work for a Christian upbringing of children, and to improve the condition of woman in Salamanca, Spain. She took the name Mother Candida Maria de Jesus, and the Congregation received papal approval from Pope Leo XIII on 30 July 1901. Mother Candida based her spirituality on the Spiritual Exercises of Saint Ignatius of Loyola. Princess, the daughter of Elizabeth and King Alphonsus V of Portugal. Entered a Dominican convent at Aveiro, Portual in 1473. The royal family objected to her taking vows because she might need to marry to insure the continuity of the royal bloodline. She agreed, fended off arranged marriages, and did not take vows until 1485 when the succession was secured. Bishop of Bettona, Italy where he was known as a miracle worker. May have been bishop of Nocera, Italy, too. Arrested by order of prefect Asterius in the late 3rd-century persecutions of emperor Maximian, ordered to sacrifice to pagan gods, and then tortured and killed with another Christian, named Barontius, when he refused to do so. Martyr. Some sources list him as one of 70 Disciples, and say that he was sent by Saint Peter the Apostle to evangelize in Italy in 58, but it’s hard to reconcile that with his death 250 years later. Abbot, probably of Louth, Lincolnshire, England. May have been bishop of Winchester, England. Archbishop of Canterbury, England, consecrated on 21 July 793. Elected to the see at a time when Mercian King Offa was trying to weaken Canterbury's influence. Ethelhard had to flee from his see for a while, but when Cenwulf succeeded in Mercia, they worked together to restore the rights of Canterbury, a matter finally settled in 802. Had Offa succeeded, his policy would not only have affected the Church, it would have seriously slowed the unification of England. Ethelhard convened the synod of Clovesho in 803, which resulted in a requirement of a pledge obedience by new bishops to their superior. Son of a Senator Justinian of Constantinople. Priest. Bishop of Cyzicus. Attended the Synod of Constantinople in 712, and may have briefly agreed to the teaching of the Monothelite heresy supported by the emperor. Patriarch of Constantinople in 715. Opposed the Monothelites and then the iconoclasts and their mentor, emperor Leo the Isaurian. Forced to resign his position in 730 and sent into exile. Several of his writings, including homilies and hymns, have survived. Studied with the Franciscans, and then at the Shkodrë Pontifical Seminary. Ordained on 24 February 1943 as a priest in the archdiocese of Shkodrë-Pult, Albania. Vicar of his archdiocese. Arrested on 12 November 1947 and sentenced to 10 years in prison during the anti–Christian persecutions of the Communist government. Martyr. Studied at the Pontifical French Seminary, and in Italy. Ordained on 20 December 1942 in Castel Gandolfo, Rome, Italy as a priest of the archdiocese of Shkodrë-Pult, Albania. Parish priest in the Buna Dajçit Coast area. Martyred in the Albanian Communist anti–Christian persecutions. Soldier in the imperial Roman army, and a member of the Praetorian Guard. Convert to Christianity, baptized by Saint Peter the Apostle. Exiled for his faith to the island of Pontia, he suffered with Saint Flavia Domitilla, and was martyred with his brother Saint Nereus. Born to the nobility. Brother of Saint Severa of Saint Gemma. Uncle of Saint Gertrude of Nivelles, Saint Begga of Ardenne and Saint Modesta of Trier. Counselor to King Dagobert I of the Franks. Bishop of Trier, Germany in 628. Attended the Council of Rheims. He spoke so strongly against the immorality of the Frankish royal court that King Dagobert was moved to personal conversion. Joined the Mercedarians in Barcelona, Spain. Prior of his house. General procurator of the Mercedarians in 1439. Attended the Council of Basel in 1439-1440. He several times visited the Vatican for consultation with the pope. Travelled to Tunis in North Africa in 1447 to ransom Christians enslaved by Muslims; he survived, but the treasure he carried was lost, and he was unable to free the slaves. First Christian missionary to Sicily. Exorcist. Many stories grew up around him, all apparently legend. Soldier in the imperial Roman army, and a member of the Praetorian Guard. Convert to Christianity, baptized by Saint Peter the Apostle. Exiled for his faith to the island of Pontia, he suffered with Saint Flavia Domitilla, and was martyred with his brother Saint Achilleus. Young layman in the apostolic vicariate of Pakse (in modern Laos). Martyr. Confessor of the faith in Ireland. His memorial is found on several calendars and martyrologies, but the details of his life have been lost. Member of the Paris Foreign Missions Society. Priest. Martyr. Uncle and guardian of Saint Pancras. In Rome, Italy the two converted to Christianity. Arrested for his faith during the persecutions of Diocletian, he died in a Roman prison. Martyr. Spiritual teacher of Saint Declan of Ardmore and other Irish evangelists. Martyred with six companion Christians. We know nothing else about them. Foster sister of Saint Flavia Domitilla and Saint Theodora of Terracina. Exiled and then martyred with her. Foster sister of Saint Flavia Domitilla and Saint Euphrosyna of Terracina. Exiled and then martyred with her. 13th bishop of Jerusalem at the time of emperor Hadrian. Martyred at age 14 in the persecutions of Diocletian.